People reacted similarly when I mentioned that I’d be giving the keynote lunch speech Monday…to the Michigan Licensed Beverage Association. As a radio and print journalist I am a story-seeker and storyteller by trade, and, concerning alcohol I can tell you this: no great story ever started with someone eating a salad! As the MLB’s Director Scott Ellis and his bar owner/board members found out during my speech Monday at the Lansing Radisson Hotel, cocktails make for compelling tales. In Amsterdam’s Schiphol Airport, the Grand Café Het Palais, an elegant brasserie, sits like an oasis in the middle of a bustling terminal thoroughfare. Hurrying through recently with my teenage son to catch a connecting flight, I only had time to call out to and wave to the bald, Egyptian bartender, who recognized me and nodded back with a big smile and nod. My son, who noticed the exchange, remarked, “Dad, that’s weird. You have ‘airport friends.’” But enough early morning breakfast Heinekens at that white, marble bar between flight connections had formed a connection. The wide variety of bars, lounges, pubs, taverns, nightclubs, and dives account for and represent every mood and situation. For instance, I asked my listeners to name the snazziest, classiest bar in Michigan. “The ‘Bloated Goat’ in Fowlerville,” joked State Senator and camel farmer Joe Hune. 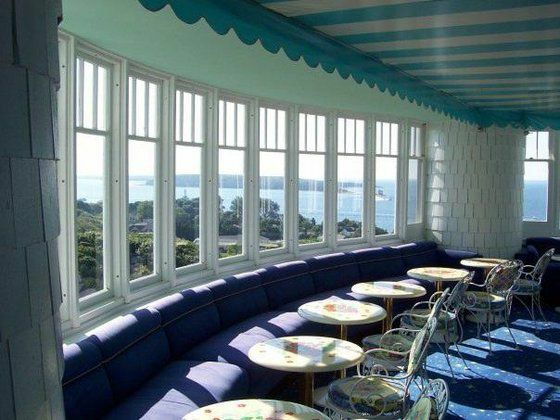 Cheryl Lutz liked three colorful northern Michigan doozies: Grand Hotel’s “Cupola Bar” for the “best views in Michigan”; the historic “Noggin Room” in Petoskey’s Perry Hotel; and “Legs Inn,” in Cross Village. Construction developer and author Craig Wieland preferred what he called the “classic woodwork, fire pit and outside dining” at Troppo in downtown Lansing. When asked for his favorite “dive bar,” Wieland nominated the “Oak Grove Tavern” in Irons, citing the thousands of $1-dollar bills tacked to the ceiling. “And once a year you can ride a horse in the front door and out the side door,” he said. “Joe’s Gizzard City,” in Potterville, got the nod from Patrick Saylor. Curiously, the oldest bar in Michigan is “Shiels Tavern,” in Hubbardston, and even with my matching last name, I have yet to drink there!